— I hadn’t read anything by Baker before, at least knowingly (I’m sure I’ve read his bylined work in the New Yorker without noting it as such). While my first impression on reading was that it worked as a people’s history a la Howard Zinn, in retrospect, the focus on Hitler, Churchill and Roosevelt (not to mention speakers of the public conscience like Ghandi and Isherwood) is of the “great men” school of historical analysis, not the “collective action” school. — Baker has probably written the only 500+ page popular history that’s great for the bathroom library, which is a good thing. (You do have a bathroom library, don’t you?) That said, the tragedy of the war is dimmed somewhat when confronted with the tragedy that is MUNI, but it’s probably a great bus and subway read as well. — I felt the note at the end should have been an introduction. I know that it would then color the rest of the book by declaring Baker’s point of view from the start, but I’m a fan of owning up to one’s biases. That said, Baker sums up the appeal of leftist politics for me in the final line — they were right. — The research was exhaustive, if too reliant on exclusively Anglophonic sources, but the language and style I felt was a bit drab. One could argue that it’s clear, direct and unadorned, but I often wanted to be alone with the primary materials as Baker’s prose suffered when compared to the poetry of the quotes employed. Churchill’s bloated, purple rhetoric reads like Evelyn Waugh when compared to Baker’s workmanlike passages of paraphrase. — I also wanted to make note on the quality of the printing, especially since we received real hardbacks and not proofs. I thought the font and typesetting were masterful, the heavy paper nicely textured, and the binding just felt solid compared to other contemporary hardbacks I’ve handled. The vellum dustcover was also a classy touch. It felt like a $30 book should. While I’m trying not to get into the actual politics of the war in my analysis, since I’m much more comfortable reviewing a book than I am a war which happened before my time (“Hitler’s deft touch with an armored unit puts his peers in contemporary warfare to shame…”), I thought that the most glaring omission was a thorough treatment of the Spanish Civil War — and not for want of English-language material on the subject. Hitler and Stalin’s first battles were fought mainly on the plain through Fascist and Stalinist proxies, respectively (I prefer not to call Russia’s regime at the time Communist, since, well, it wasn’t). Baker does right to point out that the central conflict between Churchill and Hitler was not one of ideology, but a clash of nationalists — because Churchill and Hitler were both, at their core, fascists. America’s isolationism at the time seems quaintly preferable in its humility than the imperialism it picked up and ran with after the war, but remember that neutrality was favored because it allowed industrialists to profit off of both sides in a conflict. Non-intervention in Spain made it clear that Roosevelt’s priorities were purely capitalistic, and he only comes off as some sort of welfare statist when seen in the light of the laissez-faire economic foundations the country was quick to return to, and quicker to stamp into the constitutions of the post-colonial third world. Even Gandhi’s great achievements with non-violence were undermined by nationalism, since nationalism represents religious and racial tribalism potentiated by an economy of scale. Baker makes the case for pacifism, but even when using examples of red dissent being stamped out by the Allied war-empowered plutocrats, he shorts the fact that what demagogues are more concerned about than the economic policies of socialism and communism is the call for a global class solidarity. Ahimsa would have been effective as a deterrent if the conflict wasn’t between nations but between classes, because the hegemonic class can only convince soldiers to repress their working class brothers and sisters for so long. Ultimately, Baker’s argument for pacifism founders on the question of great men versus collective action I brought up before. Giving private individuals the credit for turning the wheel of history is propagandizing an ideology that gives demagogues their power over a national tribe, and undermines class consciousness. I came across a quote from W.H. Auden in a recent Harper’s that I think sums it up: “Propaganda is the use of magic by those who no longer believe in it against those who still do.” In sculpting a narrative of venal supermen at war into bite-sized, easily digested anecdotes, he’s capitulating to a mythic worldview that has proven much more easily exploited by the violent than the peaceful. “An early draft of ‘Human Smoke’ was a sort of quest narrative, he said — a book about a Nicholson Baker-like figure trying to learn the truth about World War II — until his wife talked him out of it. …which made my initial observation (and that many of yours, it seems) make more sense – that is, that the book appears to have this sort of subjectivity without a named subject. And though that’s somewhat challenging, I think it makes the book stronger in many ways. What interests me about Human Smoke is less the interpretations of history and more the notions our two Eds (Park & Champion) raise about the structure and language, the fragmentation and pattern Baker uses to tell the story. The formal constraints of the short paragraph strip overt explanation and analysis from each contained-but-connected moment, and yet the almost poetic form enables a great deal of emotion (longing, regret, grief, anger) to bubble up within. In that, it reminds me of nothing so much as Dos Passos’ depiction of the First World War in his USA Trilogy and Mr Wilson’s War, the overlapping bursts and bits, the large cast of characters, the repetition and the strong character voices. I suspect I’ll have more to say as I finish the book, but wanted to pull back a bit from the discussions of history & military theory a bit, I suppose. Thanks to Ed for inviting me in — I just got the book and am less than 100 pages in, so anything of substance I have to say about it will have to wait for later. But it’s already causing me strange and contradictory reactions, all now heightened by the discussion here, and I wanted to record those before, once again, my feelings change. First, this can’t help but be a personal book for me, oddly enough, and that was the reason that, when I saw Ed’s galley at a recent reading we both attended, I immediately got the publicist’s contact info. I grew up amidst the detritus of WWII — my father, who died in December, had collected artifacts from the war for most of his life. Documents, posters, film, guns, uniforms, barbed wire from Belsen, postcards sent from the camps to family members telling them everything is fine, blueprints for various theoretical weapons, etc. etc. He never seemed to understand, himself, why he collected all this material. He briefly tried to run a Holocaust museum, and nearly went bankrupt doing so, because it was in rural New Hampshire and he didn’t want to advertise it, since he felt that would be tantamount to advertising the Holocaust. Then he stopped charging people admittance, because he didn’t want to profit. Eventually, he was so far from profiting that he had to go back to doing what he’d done before, which was run a gun shop. So now, as I try to figure out how to liquidate his estate, I am stuck with figuring out what to do with all of these items, a lifetime’s collection of darkness (yes, the Holocaust Museum in D.C. is on my list of places to contact). For me, WWII was something to escape, because it was my father’s obsession. He had theories and interpretations for everything, strong judgments about every book and movie about the era that he encountered, and by the time of my adolescence, when I was trying to figure out who I was and trying to distinguish myself as a different human being from my parents, I started wondering about my father’s interpretations of things, his love of Patton and great admiration for Churchill, for instance. I read Howard Zinn and changed my political viewpoint to one far to the left of my father’s perspective, and I studied as much as I could of the history and theory of pacifism. WWII remained the challenge for me, of course, as it is for anyone who wants to believe nonviolence can triumph — what do you do about fanatical military aggressors? I didn’t know then, and I don’t know now. I’m grateful for the historical perspectives that have been offered on Human Smoke, because as I’ve been reading I’ve been wondering about all that has been left out, and my own knowledge is too spotty to create a systematic map of the missing landscapes. What fascinates and frustrates me about historical writing is that it can never be truly comprehensive, that there are always other ways of looking, other facts (perhaps this is why I tend to read more fiction than nonfiction; in fiction, this tendency thrills me, in nonfiction it tends to be at least a little bit frustrating) — the challenge, of course, is to determine what’s relevant and why (just because somebody else could tell a different story about my life this morning at 8:33 AM does not mean that it would be significantly and meaningfully different from my own … although it might…) The struggle I’m having with Baker is one I am enjoying — the struggle is to figure out what weight to place on what he has put in and what he has left out. For me, it’s like reading a translation, because I can’t help but reconfigure various sentences in my brain to imagine alternatives. Perhaps one of the book’s strengths lies in its insistence on the imagining of alternatives in a world where it seems the general view (at least in the U.S.) of the “meanings” of the era around WWII are solidifying into standard and fairly simplistic moral formulae. I like our discussion so far, because it seems to be suggesting that the complexity Baker offers (or tries to offer, depending on your view) is still not enough. Well said, Judith and Matthew. I don’t want to prematurely close off the lively discussion we’re having about history, speculative history, and pacifism when I say this, but such a debate is endless–and that’s a wonderful thing–but it’s not a thread that I can imagine anyone being able to tie off neatly. By picking pacifism as his lens, Baker opens up a bunch of really tough questions about why World War II happened–and, to a certain extent, why any war happens–and what can be done to stop it. I can’t speak for anyone else here, but my own response to that logic is to a large extent grounded in my own response to absolute pacifism, which is very inviting to me as an abstract concept, but a really hard row to hoe in practice. Judith and Matthew, meanwhile, have steered us back toward the question of why Baker chose to put the book together as he did, and what effect it has. We’ve talked a lot about its myth-destroying and complicating effects; Baker’s method has given us a lot to talk about. At least from my perspective, one of the other things that the method allows Baker to do is to illustrate what some academics like to all war’s brutalizing effects. Early in the book, there are intermittent mentions of the fact that, at the war’s outset, both the British and German publics were opposed to war. Even when the bombs began to fall, many people remained opposed–there’s that heartbreaking anecdote about the plea for peace from the residents of the London neighborhood reduced to rubble. But as the bombings continue and more people are killed, more things broken, Baker gives you the sense that one by one, people snap–they just can’t take it any more–and rather than capitulating to the enemy, they start talking about bombing the enemy as they’ve been bombed, hitting back as they’ve been hit–or worse, wreaking ten times the damage that they’ve suffered. World War II is rife with instances about how brutality begets brutality and dehumanization multiplies, at the level of armies (John Dower’s War Without Mercy comes to mind) and individuals (Robert Jay Lifton’s The Nazi Doctors, in which doctors at concentration camps perform ever more barbaric experiments on the inmates), and studies of other wars show the same thing. But too often, those observations are couched in academic language, or even if they’re not (the above two books are eminently readable), they’re just in the parts of the bookstore where most people, let’s be honest, simply do not go. I was grateful for Baker for illustrating this concept in a very compelling and accessible way, and for getting it into the part of the bookstore where people do go. I can’t imagine criticizing Baker for not providing enough information, eg on the Treaty of Versailles. I can’t even reconstruct a valid argument for Baker’s obligation to have emphasized or not emphasized some feature, event, player, subplot. This is an instance when I think the truism/cliché, “It is what it is” works for me. Also, I take that to be complaint akin to criticizing an author for not writing a certain kind of book instead of dealing with the book that was written. Someone asked about the opportunity for civil disobedience and demonstrations under the Nazis. A few years ago I was told—and there may well have been a book on this— that 10,000 German hausfrauen, wives of Jews, demonstrated in Berlin. An instance, that at the time, served to remind how much I didn’t know about living under the Nazis Human Smoke also serves as a reminder. It’s a longer discussion— but let me suggest that there is an ongoing conflation of literary ideas with historiographic(al) ones. This seems to have something to do with some unresolved and farmisht notions of objectivity (pseudo objectivity) /subjectivity. I’m glad someone brought up Howard Zinn as I think he has a sensible view of this pseudo issue. Search engine Zinn and I am ceratin his explanation comes up fairly obviously on the Howard Zinn.org site. The larger impression and inchoate feeling I have about Baker’s effort is that it reinforces my sense that the fulminating and ululating about the transformation of the world (for Americans) after the World Trade Center was demolished, comes from a shameful ignorance of that world. Gil Scott Heron intones in his masterful Money And The Military, “Peace is not the absence of war but the absence of the rumor of war.” Was the world at peace prior to Sept 1, 1939? Was the USA at peace prior to Dec. 7, 1941 and after the surrender of the Axis countries after Aug, 1945? And was the USA at peace prior to Sept 11 2001? I say no to all and believe that indifference to events beyond the shores of this nation allow for the kind of dysfunctional international relations we are burdened by now. One of the lessons (though by no means would I accuse Nick Baker of being didactic) is that there is steady drumbeat of activity being played out all of the world simultaneously, sequentially, in the 11th dimension and in the lunatic visions of various megalomaniacs in numerous world and third world capitols. We would do well to pay attention, even one in a while. 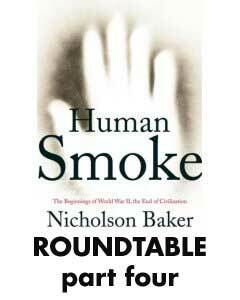 By the way I suggest that Human Smoke warrants at least one further reading—need I explain why? In reference to your comment on the Treaty of Versailles – I never wrote nor intended with my words that Baker had to analyze or scrutinize the treaty in his book. Having said that however, in his book Baker more than once has selected pieces to highlight that suggest certain things – such as that the US drew Japan into the war (this is just a single example). If he juxtaposed that with certain info from the treaty that revealed how Japan was made powerful by that document while China was simultaneously weakened (I’m talking just another entry or two in the book) then it would go a long way towards showing that there were complex machinations at work here that dated back decades. Which I think is true for that aspect of the war in particular. I don’t want to make this a discussion about military theory however. And I don’t want to suggest that I’m looking for a book other than the one Baker wrote. I feel the book he did write is absent of balance more than once however and if this was published as something other than strictly a nonfiction history of the causes of WWII then I would say “fine – no problem”. But that is how it is being published and so I see that absence of balance more critically then I would otherwise. I did want to ask also what was thought of his choices overall of what he included and chose not to include…in other words, I wondered when I saw that inclusion about Eleanor Roosevelt making anti-semitic comments and if that was something relatively minor in her life, or a fundamental part of who she was. In his afterword he noted that he relied heavily on the NY Times so I was curious as to whether he went looking for certain comments or certain subjects or stuck with what was most prevalent. I have NO COMPLAINTS about his choices, I’m just curious as to whether anyone had thoughts on how he gathered them. Hi again, all. I feel some regret that this conversation has taken on a strident tone, especially since in my enthusiasm I probably contributed to this. I know we are all hoping not just for a political discussion but also a literary one. Unfortunately, my post today won’t help, because what I mainly have to share is my findings after re-reading many chapters of William Shirer’s Rise and Fall of the Third Reich (the most generally trusted primary source on the European war in the English language, I think) covering 1938 and 1939, including Chamberlain’s appeasement at Munich to solve the Czechoslovakian crisis and the Allied decision to go to war after the invasion of Poland. The main thing that struck me, in rereading these chapters in context of Baker’s book, is how hard so many politicians, so many diplomats, so many military officers, so many writers, so many journalists, so many activists and citizens tried to help the nations avoid this war. The popular sentiment against returning to the horrors of total war was very strong in every part of Europe in 1938 and 1939, according to Shirer. These chapters are filled with pained, agonizing appeals from every corner of Europe to avoid the disaster. As Baker says, many Nazi military officers were dead-set against the invasion of Poland because they saw (correctly) that Germany would be destroyed. Mussolini was against it, because he saw (correctly) that Italy would be destroyed. Chamberlain has been demolished as an “appeaser” by history, but his motives were certainly the right ones (though his judgment turned out to be tragically flawed). Stalin eagerly welcomed the war because he hoped to keep Russia out of the worst of it and watch all his enemies destroy each other — that is, the one world leader who did the most to enable Hitler in August 1939 did so because he incorrectly believed his nation would not be drawn in to the fight. It’s also very clear from Shirer’s book that Hitler did not want war with France and England. He and the other top Nazi leaders saw correctly that Germany’s only chance was to pull off a diplomatic finesse (as they had done before) to keep England from unleashing its full strength against him. By the time the tanks rolled into Poland in September 1939, there was still a slim chance for a diplomatic settlement, and according to Shirer’s book the Nazis universally saw this slim chance as their best chance. According to this interpretation, Hitler lost World War II not on the battlefield but in the conference room, because it seems to have been widely recognized at the time, in Germany and elsewhere, that Germany was badly outmatched in a war against Great Britain. The day before, on October 11 [1939, just after Germany’s invasion of Poland], there had been a peace riot in Berlin. Early in the morning a broadcast on the Berlin radio wave length announced that the British government had fallen and that there would be an immediate armistice. There was great rejoicing in the capital as the rumor spread. Old women in the vegetable markets tossed their cabbages into the air, wrecked their stands in sheer joy and made for the nearest pub to toast the peace with schnapps. There are so many ways to look at Baker’s book, and to argue for or against the political conclusions the book suggests. But, historical interpretations aside, I think it’s a very notable (and little known) fact how hard Europeans in every nation worked to change their dreadful fate as they slipped helplessly into war. See, Colleen, it’s not only us rabble out here who thought your critique was facile and sophomoric. Next time respect the author and try to formulate some thoughts on what was written, not the fantasy of what you would’ve written. In other words, it’s not about you, or how smart you think you are, it’s about the book. Again, folks, Colleen is entitled to her opinion. Tomorrow’s installment thankfully sees the disagreement becoming more civil. And I do hope that any discussions extending from this roundtable can likewise live up to this standard. Nice touch using my last name – still don’t want to put your own out there, do you? I said more than once why I had issues with this book. A careful reread of my respones, and everyone elses, shows clearly why I feel the way I do. Colleen, you said “if this was published as something other than strictly a nonfiction history of the causes of WWII . . .” I think that’s the source of your discontent. It’s an essay, not a treatise. It’s about the beginnings of the war, not about the causes. It’s provocative, sure, but it’s also humble. Those spaces in between the paragraphs leave all kinds of room for doubt. Maybe Hitler couldn’t or shouldn’t have been appeased, but how many books are willing to take on the notion that the violence of WWII might have been mitigated by a pacifist approach? The British Empire wasn’t Hitler, but Canada and the US manage to function about the same today, and only one of those countries went to war with England. And one more thing: What does anyone using their name, real or fake, have to do with how you approached Baker’s book, especially when there are others, besides the anonymous cretin above, who agree that your approach, the way your framed your argument, was inherently flawed? Listen what people are telling you; learn from it. Who knows, it might help you become a better writer. You’re never too old to learn, you know? The comment above is not from me. Someone else used my name. Please don’t hold me accountable for what they said. There’s more on this discussion tomorrow James and you’ll see that a few others had a similar complaint about the book. It is classified as “World War II – Causes” on the copyright page which is an all encompassing classification – in other words it can’t just be some causes I think or the author’s choice of causes. But aside from that, what bothered me (and what I tried to convey in the conversation) is that Baker emphasizes certain things again and again while barely mentioning or outright skipping others. I have no problem at all with a pacifist history of the war years – in fact I think it would be facsinating. (As I mentioned at some point I’m a very big fan of Vera Brittain’s writing.) But to only show the negative side of multiple issues in order to bolster your own argument does not read as nonfiction to me – it’s just too slanted by the author’s perspective. But hey – that is just my opinion on the book and I’m happy to read yours and others’. I would be interested to hear the justification for this claim.